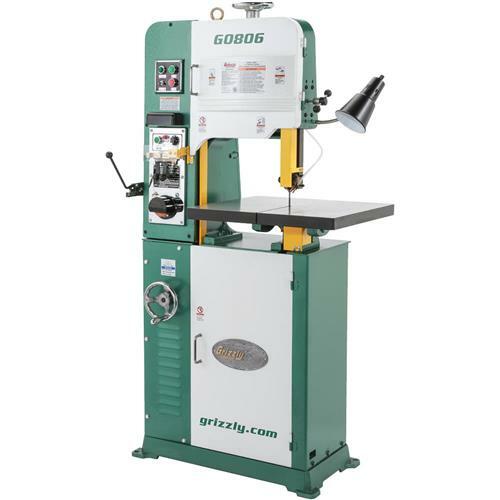 The G0806 is the 14" little brother to our G0807 18" Vertical Metal-Cutting Bandsaw. It offers all the same great features but in a smaller package. 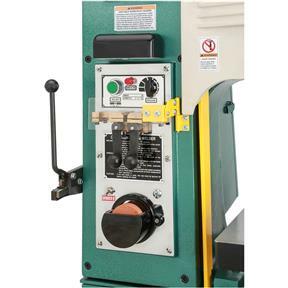 Variable-speed blade controls allow for blade speed adjustments from 88–384 FPM. The adjustable work light and chip blower keep the work table clean and bright for both safety and precision. 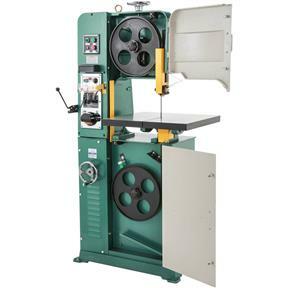 This bandsaw also features an on-board blade cutter, 1/8 HP grinder, and welding station! Now you can save money by creating your own blades from bulk coils of band stock or make inside cuts. The selective use of cast iron in the frame absorbs vibration and ensures rock-solid performance for years to come. Blade welder thickness range: 0.025"
Table size: 22-1/8" x 19-7/8"
Floor to table height: 39-1/2"
Approximate shipping weight: 890 lbs. 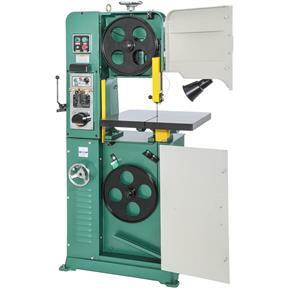 This is an excellent heavy duty machine, professionally designed and outwardly very attractive. I mounted mine on the Grizzly heavy duty mobile base to move around my crowded garage shop. The UPS delivery man was incredibly helpful as I was surprised the machine was shipped laying down and didn't fit the space I had prepared for it. Delivery guy used my pallet jack to shoe horn the delivery into my garage. Just one thing could have been different about the machine. For safety during use, the blade guide should be as close as possible to the work. The guides on this machine don't go any closer to the table by almost 2 inches. Not a big error but I prefer less blade exposed for cutting thin plates. I was also very happy because my purchase was accidentally just before the catalog price increase! I have several Grizzly products and highly recommend Grizzly as a top quality machine supplier. I am a mold maker / tool maker by trade. This saw does a good job and the blade welder is very useful. You can buy blade stock and save money by making your own blades, not to mention that you can fix a blade if it breaks.